Two weeks before Christmas, sitting in a smoky Parisian cafe, an email popped into my inbox from UniLad Adventure, inviting me to Slovenia with them for a week. The only catch, was that I'd have to be filmed throughout the whole trip. On one hand I was thinking how perfect it was, that I hadn't got a busy diary for that week (except Girls Night, which you can bet I considered because I never like missing out), but the other hand, that dreaded worry lurked over me. How would I be on film? I've only just started having photos of myself taken again, so could I really be comfortable in front of a camera? In my swimwear too? And after wanting to debate it with the other half, he shot all my panics right down and told me to agree to it. And you know what? I'm so glad I did. Slovenia wasn't hugely a place I had on my travel list. Sure Lake Bled was, but the rest of it I wasn't too fussed. But oh how I regret this, because Slovenia is all kinds of beautiful and wonderful and has this magical air about it (and cold air at that too). Everyone is warm and friendly, and the scenery is breathtaking on every road, every bend and corner, and every location that we saw. Especially Lake Bled. 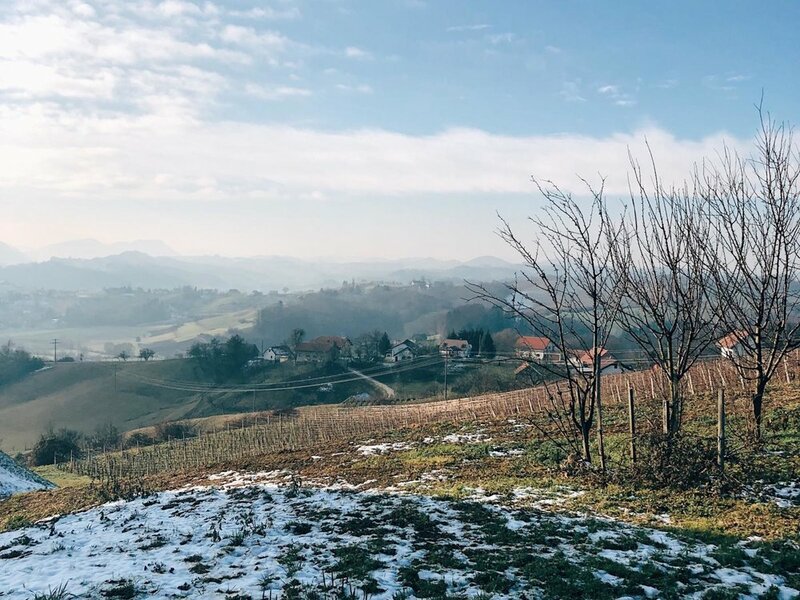 Rimske Terme is located in one of the most beautiful places in Slovenia, Rimske Toplice, and gives you the chance to take a break from everyday life, and enjoy the slower things such as health, wellbeing and relaxation. Their Roman baths are popular, with many people taking advantage of the thermal water for its healing and cleansing effects. Whilst I wasn't solely convinced, there's no denying that their spa and wellness areas are absolutely beautiful. Their bedroom decor may be a little questionable to my personal taste (circle bed and zebra print carpet?! - check out my Instagram stories highlight for that), but you couldn't help feel relaxed here. Our first night was spent here, and as we'd arrived after dark, we didn't quite realise the scale of what we'd be waking up to in the morning. We spent the first night meeting all of the incredibly friendly staff over a delicious dinner and endless glasses of (very very nice) wine. At 11pm, we were allowed private access to the Roman baths for a very late night swim, and it's fair to say, that was an amazing first night to have. The following morning, our alarms went off at 6am, ready to shoot in the spa and brave the cold outdoors - but with a view like above on the patio, how could you not mind the early wake up? Driving through Slovenia is fairly easy, and part of what made us enjoy this country more. Every road we seemed to travel on, we found new things to look at, and spent so much time pulling up on the side of the road so we could either get a closer look or attempt to capture it. And even the cemetery which we couldn't help but admire (in the most bittersweet way) just how well maintained it is. Rogaska Spa, is an interesting one, and a place I'm still thinking about - because, well, I just don't get it. Before arriving in Slovenia, I knew little about the country and soon learnt that their spas are important due to their healthy mineral water. 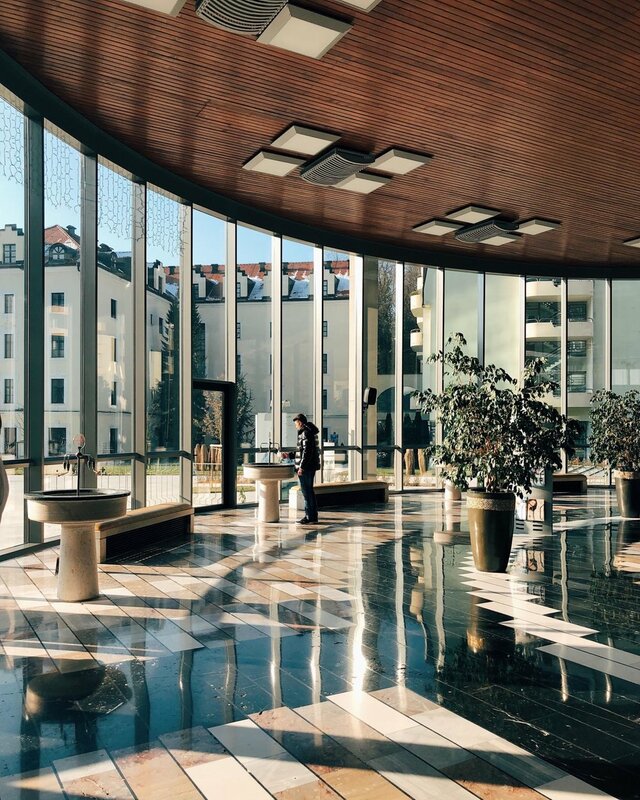 So we took a trip to Rogaska Spa/Medical centre to see a different side and where people go for various reasons, such as healthy living, doctors orders or beauty purposes. The water at Rogaska in particular is high in magnesium, and dependent on your doctors advice (when you check in, you have an appointment with a doctor - crazy huh?) you drink it three times a day, bathe in it and have treatments with the water. It heals you, so they say. Terme Olimia to me, is like the Slovenian Center Parcs equivalent. Located in the small town of Podcetrtek, the area is surrounded by lush greenery and offers various hotels and wellness centres to suit couples, groups and families. It's a big place, and with it being close to Croatia too, a popular spot. 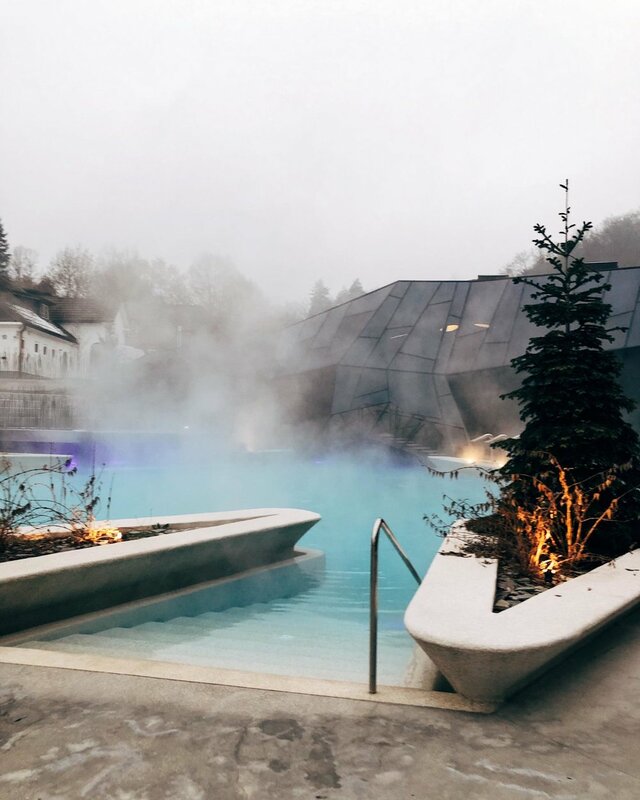 Their wellness centre, Termalija is the largest sauna complex in Slovenia and also has plenty of outdoor swimming pools. 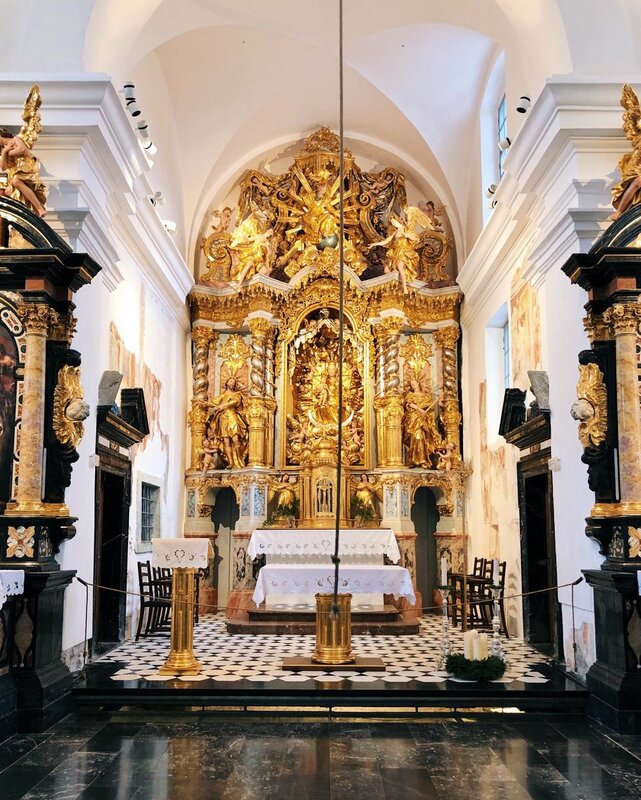 We spent our second night here, and having arrived after our morning visit to Rogaska Spa, we enjoyed a three course lunch followed by some treatments in one of the spas. They were incredibly keen to show us everything, which was super sweet, but with the pools and relaxation rooms eyeing us up, we just wanted to chill. The morning was spent shooting in all of their huge spas and enjoying a ride down the slide (or attempting too). I think I could get used to having full access of the pools before anyone else arrives, because that is how to do relaxation. When I saw the itinerary for our week, I was super excited to see Lake Bled as one of the trips, because it was somewhere I'd been itching to explore so I popped on my eager pants, all excited. As we arrived into Lake Bled, we were blown away by the scenery and couldn't wait to park up and see more. Our Pletna boat ride was waiting for us, to take us to the island of Bled for an hour to see the Church, the Tower and have a go on the Wishing Bell. After fifteen minutes on the lake, we climbed the steps of the island and admired the views for a lot longer than we can remember. For such a small island, it was beautiful, and something I would 100% recommend doing. Whatever the weather too! After forty minutes or so, we hopped back into the Pletna boat and went to browse the Christmas markets. Our original plan had been to also visit Bled Castle, but due to the season, the days were getting shorter meaning that we wouldn't have been able to create the content that was needed, so instead went in search of hot chocolate to warm ourselves up. Whilst we only stayed for the day, you could easily spend a few days here as there's so much more to discover of this beautiful place. I wasn't really sure what to think of Ljubljana but what a quaint and beautiful city it is. We'd arrived in the city on Wednesday evening and didn't venture into the town, instead opting for some downtime and a pretty late dinner in the hotel. 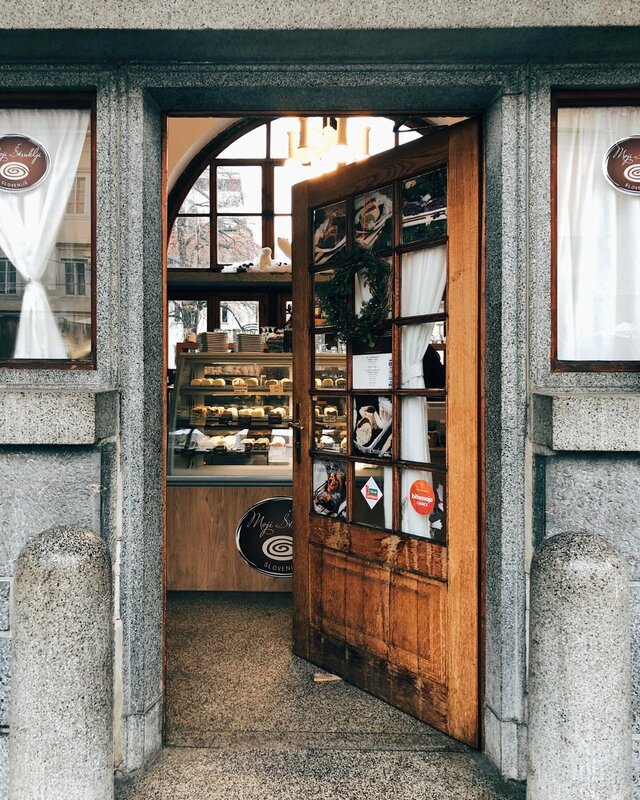 By morning, we were ready to explore, and browsed the Flower Markets, wandered the streets, saw the castle and took a stroll along the picturesque river canal, and with Ljubljana being pretty compact, you can easily explore the city in a day. It was fairly quiet for us but with it being a Thursday morning, we knew by Thursday evening, this place would absolutely come to life. We started one of the mornings at the castle, and as soon as we pulled up, we were blown away by how incredible it looked. The photos almost didn't do it justice, with the scale being much larger than you can imagine. The cold and damp weather only added to the eerie atmosphere, and it's clear to see why this is such a popular tourist spot. Postojna Caves was by far my favourite thing of the whole trip, and one that I cannot recommend enough to anyone and everyone who is thinking of visiting Slovenia. Admittedly, it was the thing we were least looking forward to from the itinerary, because we didn't really know what to expect. 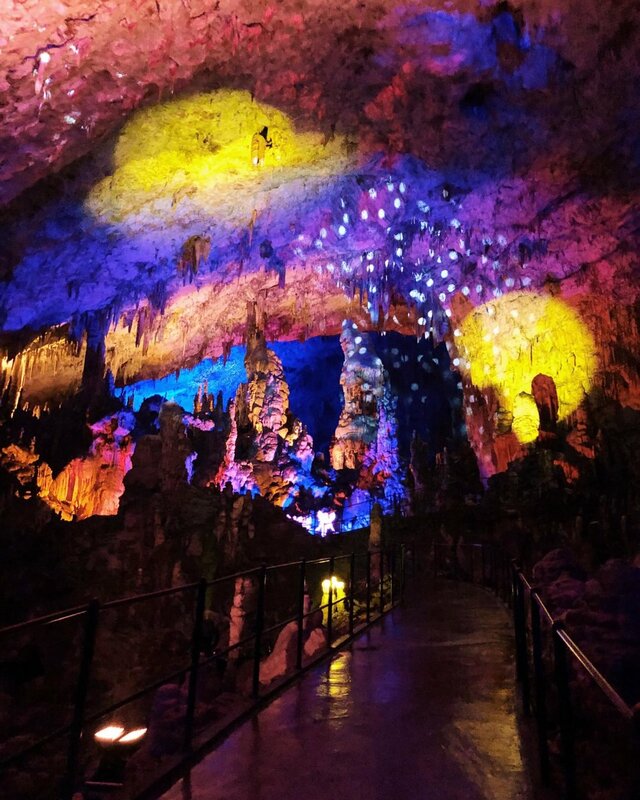 Postojna Caves are some of the world's most captivating ones and having been around for four million years, they certainly offer a fascinating experience. As we arrived, our guide told us we'd be down in the caves for roughly two hours (so always make sure to pee beforehand!). We boarded their train, along with many others (it was actually Slovenian press, as we were having a preview of their annual Nativity Scene), and along we went on this little track for the next ten minutes, getting deeper and deeper into the caves. Actors greeted us, dressed in nativity clothing and lead us down a path and within minutes I felt overwhelmed. Overwhelmed that we live in this world, with such beautiful and incredible things like this, Postojna Caves. It's fair to say, that the following few hours were some of my favourite yet - and a little like the castle, no photo can ever do this place justice. It almost felt like it wasn't real, yet you couldn't take your eyes off any of it.It was truly truly magical. It was certainly a trip that I won't be forgetting in a hurry, and I'm already working out when I can next go back to visit (those caves and the city in particular). Plus it was so lovely to spend time with three new people, who not only made me feel comfortable infront of a camera, but also provided all of the laughs. What a week it was!If you haven't already seen my debut with UniLad Adventure, you can check out the Youtube video here and Facebook video here. *I was kindly invited by Unilad Adventure and Luxury Slovenia, however all views and photograph are my own. Photos that include me (taken in Lake Bled), are by the talented Ben Wright.